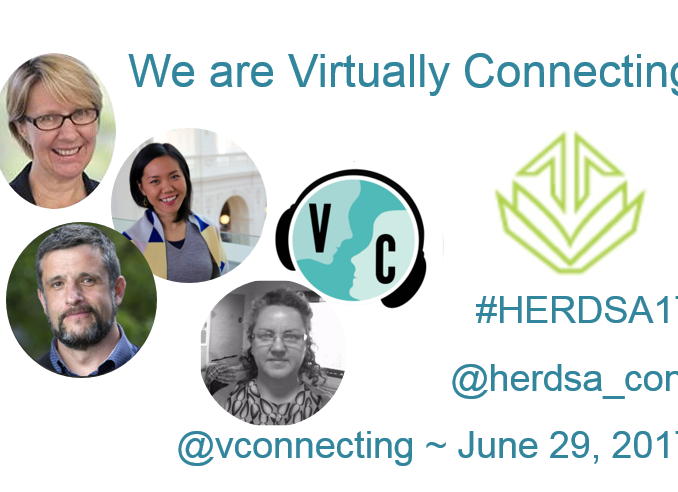 We’re @Vconnecting from #HERDSA17 on June 29. Sydney Australia. We’re excited to be Virtually Connecting from the Higher Education Research and Development Society of Australasia (HERDSA) 40th Annual conference. The theme for the conference is Curriculum Transformation. Effective curriculum transformation is seen to optimise the curriculum as a framework for student learning and experience rather than as simply an organising framework for disciplinary knowledge. It puts quality at the centre of this process and ensures support for staff in curriculum development and innovative teaching practice. See the Conference website for more detail. We are connecting with Professor Eeva Leinonen. Chie Adachi and Colin Simpson are our onsite buddies for this session and Wendy Taleo is the virtual buddy. Professor Leinonen is the Vice Chancellor of Murdoch University and has an academic background in linguistics and psychology and has extensive experience in higher education in the United Kingdom, Europe and internationally. If you wanted to get to the conference but can’t make it, join our Google Hangout by tweeting us @vconnecting or leave a comment below. We’ll ask for your email address so we can send you a link to the session just before it goes live. The timezone section below will show you the session time in your local timezone. Connecting with Professor Eeva Leinonen (Murdoch University). Chie Adachi (Deakin University) and Colin Simpson (Australian National University). Watch and tweet: watch the session live (see the embedded videos above or go to our YouTube channel www.youtube.com/virtuallyconnecting). If you choose to Tweet along, please tag @vconnecting and add #HERDSA17. If you are attending the conference and wondering what’s for me, stop by we would love to see you!! You don’t have to appear on camera. We would love for you to come by, listen to the conversation, take pictures, and tweet about the experience. Please note that even though we have events scheduled ahead of time, sometimes we start a little earlier or later than planned for various reasons. We embrace imperfection and spontaneity and we hope you will too, understanding the nature of hybrid connections.